Harry Dresden is the new sheriff in town. Drafted into the Wardens, the military arm of the White Council of wizards, he is assigned as a regional commander. One of his first assignments is a report of black magic use in Chicago. His first attempt to find the black magic is interrupted by a phone call from Molly Carpenter, the daughter of his friend Michael. Molly brings him a case that involves horror movies coming to life, literally. Faerie creatures take on the look of creatures straight out of the horror movies. Since Harry does not believe in coincidences, he quickly concludes that the two cases are related. This book revisits the world of the Faeries and involves Harry diving deeper into Faerie politics. He’ll call in a favor owed him by the Summer Lady, but as with most favors he gets what he asked for, not necessarily what he wanted or expected. In this book, Harry will begin to notice consequences from the decision he made at the end of Death Masks. He notices, or has pointed out to him, changes in his personality. This plot line will not be concluded until the book White Night. I bring this up because it points out a skill Jim Butcher has, he can integrate minor plot lines across multiple books and bring them into both the individual plot lines of each book and the overarching plot line. 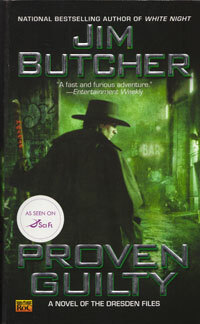 My initial fear was that the plot lines carrying over from book to book would interfere with my enjoyment of individual books, but Butcher manages these plots with amazing skill. This book shows the distances to which Harry will go to save someone he cares about, including sacrificing or risking his own life. He expects a lot out of other people, but in the end, he expects more out of himself and he delivers, usually.